Are you thinking about modernising your bathroom? Are you looking for bathroom fitters? London building firm, My London Builders might be who you’re looking for. My London Builders are the bathroom fitting experts in, and around, the city of London. We strive to turn your bathroom fittings and bathroom renovation projects into a reality. A bathroom is perhaps the most private space in the house, where people conduct their very personal activities. It’s also the smallest room of a house, making creativity a real challenge. In the majority of rooms, space is at a premium, storage can be awkward and pipes are everywhere. It takes real creativity to be able to design and install a bathroom. It’s the most difficult place to work in a house. It’s on par with a kitchen for complexity, but with less room to move. That’s where it pays to get the right bathroom fitters. London has plenty to choose from, but none of them will have the dedication, and attention to detail as us. At My London Builders, we realise the importance people place on making their bathrooms comfortable and beautiful. This is the reason why we offer affordable and hassle-free bathroom refurbishment solutions. We have years of experience in bathroom fittings and have earned a loyal customer base. We are specialists in our field and can offer you the best possible service, for a very reasonable price. You don’t have to worry about the price you will be paying as you are guaranteed to get the best possible value for money. We know times are hard, we know every penny is sacred. That’s why we combine realistic quote, with quality work. It’s the least you deserve from your local builder. My London Builders has a team of the finest bathroom fitters in the city. We can handle your project from the planning phase all the way up to its completion. We can help with design, planning, permissions, building regulations, inspections and everything else you need to get the bathroom you’ve dreamed of. Regardless of how large or small the project, we can promise you a reliable and high-quality service. With our technical prowess and state of the art working methods, we can transform your bathroom into a modern and comfortable space. Bathroom fitting can be an interesting and fun way of giving a makeover to an important area of your home. 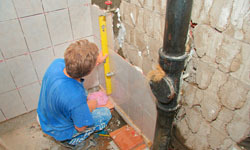 But if the bathroom fitter undertaking the remodelling project doesn’t know how to handle the task, it may become an expensive and stressful venture. Therefore, it makes perfect sense to hire the best firm for the task, whatever it may entail. For bathroom fitters, London building projects and anything property related, call My London Builders. We provide free quotations, guarantees for our work, and excellent customer service. It’s our goal to not just deliver on our promises, but to exceed them. At My London Builders, you are sure to get reliable and professional services that you deserve and desire. If you are looking for the right bathroom fitters in London, your search ends here, with us. There is plenty to consider in a new bathroom, the space, budget, bespoke or shop-bought and of course bathroom fitters. London has plenty of everything so feel free to let your imagination go wild. Planning a new bathroom is exciting. It’s an evolution, where a dream is refined into an idea, then downsized into reality.